Senpai Luis Ortiz has been studying karate since 1999 and has been instructing children’s classes with Sensei Amelia since 2001. In addition to being an excellent children’s instructor, Senpai Luis has been teaching karate to adult blind students since 2006 bringing his first adult student all the way to achieving a black belt in 2012. Senpai Luis was born visually impaired with a condition called congenital cataracts and is the first legally blind student to achieve third degree black belt status. His dedication to his training and experience teaching others make him an instructor with great attention to detail and an exceptional degree of patience with children studying karate. 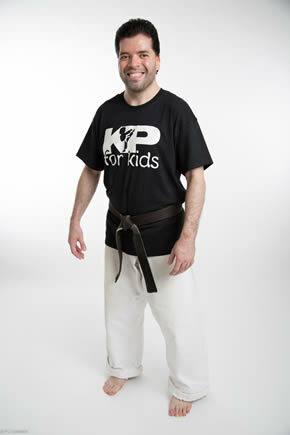 Senpai Luis is known by all of the advanced KP for Kids students as an excellent teacher, mentor and fighting instructor. Senpai Chris Adamec is a very important part of the future of KP for Kids having started teaching with Sensei Amelia in 2012. Senpai Chris plans to grow with KP for Kids and pursue a career in teaching children martial arts, body awareness, practical self-defense and meditation. As a boy, Senpai Chris’s interest in martial arts started with classes in Taekwondo and as an adult his focus turned to traditional Japanese karate. Senpai Chris attends CUNY York College and is studying for a business degree. Everyone at KP for Kids is looking forward to supporting Senpai Chris as he develops additional KP for Kids programs here in New York City. Senpai Carol Serrano is thrilled to be a part of the exciting KP for Kids team and so is everyone who works with her. Senpai Carol started her karate training under the mentorship of Sensei Amelia through the Wingspan Arts After School program. Prior to the Wingspan partnership, she completed a Teaching Artist training through the Community Word Program’s Teaching Artist Training and Internship Program (TATIP). Senpai Carol looks forward to continuing her karate training with the KP for Kids staff while enthusiastically helping to develop KP for Kids programs in schools throughout NYC. Senpai Sabrina Martinez is 16 years old and has been training with Sensei Amelia for 10 years. She is an adult brown belt and has been an assistant instructor with the children’s classes for two years. She has an 11 year old brother, Adam, who is a junior black belt. Both of her parents are doctors. She attends Baruch College Campus High School, and is currently in 10th grade. She enjoys doing activities such as karate, tennis, soccer (sports in general), drawing, singing, playing piano, writing, reading, painting, and watching movies.